I have yet to touch on the subject of Freeganism, an anti-consumerism movement which advocates alternative living with limited participation in the conventional economy and minimal consumption of resources. 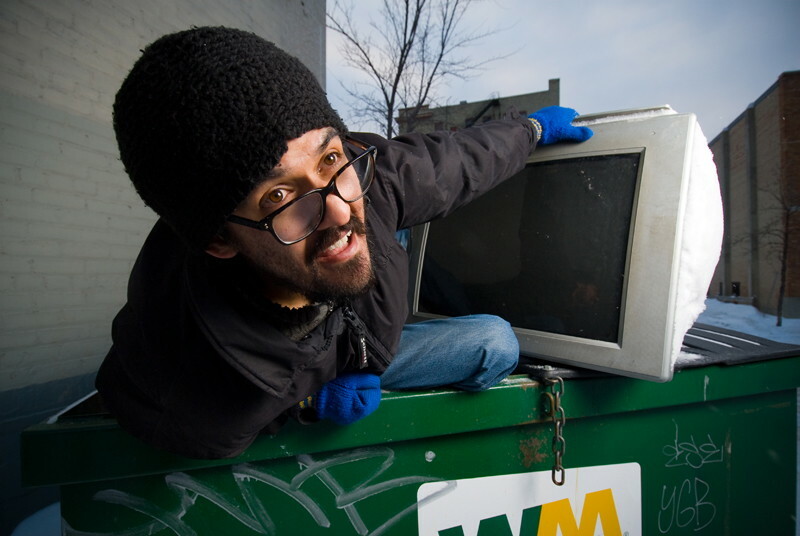 Although Freeganism, a portmanteau for vegan and free, is most often associated with dumpster diving for food, it is not limited to food foraging. It also encompasses recovering and reusing materials found in the skip. I have referred to this in the past as treasure hunting. Last August, I wrote about a neighbourhood treasure hunter, a very young-looking 65-year-old woman by the name of Joyce. I ran into her again on Friday morning in the park. She set down her bags on a park bench, and we had a chat about her philosophy on recovering and reusing the preloved. As I stated in my post last summer, Joyce collects mostly cans and bottles for the deposit money, but what she really likes to uncover are magazines and newspapers, which she passes along to a hairdresser who then passes them on to his clients with reduced mobility in seniors' residences. Although she gave me a few general ideas about what she discovered, I was curious about the specifics and her motivation for treasure hunting. "I'm 65 and with all the changes in technology, I gave up on trying to find work. But I hated sitting around and doing nothing. That's how people get sick and old." she said. Joyce's neighbours often put in requests for things they need. Recently, one neighbour told her that he needed some tupperware. Within a few days, she had found some. "Do you ask them to pay for what you find?" I asked. "Of course not. That wouldn't be right," she said. "But you're the one who did all the legwork to find it," I said. "No, I enjoy finding things that people need and then giving them away. It's true what they say, 'give and you shall receive,'" she said. I sensed that Joyce had something more to tell, but I could see that she felt slightly ill at ease. I wanted to find out what what she had received, but I could wait. I told her that she could be a Freegan, a concept that she was acquainted with. Our treasure hunter said that she didn't forage for food and made it abundantly clear that she was not poor. Joyce did not see herself as a Freegan, but instead a good samaritan. She enjoyed giving her treasures away to those who needed them most. I felt that I had my opening now. "So what's the best treasure that you have ever found?" I asked. She took two steps closer, and her voice dropped to a whisper. "Someone had moved, and they had left a pile of things outside on the curb that had hardly been used. I found two Lagostina pots without a scratch on them, a new Sony radio and a beautiful leather purse, which someone had thrown out because the lining had come unsewn. Can you imagine?!" she said. "Inside was a smaller purse that was brand new. It looked like a gift that someone hadn't liked. The style was too young for me, but I'd find someone to give it to. When I got home, I pulled out the smaller purse and showed it to my husband. He opened it up, unzipped the side pocket and found an envelope. We both looked at each other in disbelief. I opened the envelope and inside I found 500 Euros or the equivalent of $600," said Joyce. That was quite a reward for our good samaritan, but somehow I wasn't surprised by the discovery. In recent years, I've seen all kinds of valuable items hastily thrown to the curb, and it seems that they're being thrown away because the owner can't think of anything else to do with them. Anyway, it makes me feel better knowing that there are people like Joyce saving things from becoming landfill. Freeganism is a solution to protecting our resources. I'm not suggesting that people dumpster dive for food, but it might be a good idea if we all considered what we really need before we buy. Reader have you ever picked something up curbside? Please tell us what your best find was. I'll go first. In 1993, I found a colour TV and a top loading VCR. Both were very heavy, but well worth the haul, and they suited my post-Master's financial situation. : Freegans, Treasures and a Pot of GoldTweet this! Je crois que tu adorerais le film d'Agnès Varda "Les glaneurs et la glaneuse", tourné en France, où elle rencontre toutes sortes de gens qui ramassent ce que nous négligeons ou jetons. Wow! J'espère qu'il y a plus du monde qui porte le même gène du glaneur que vous Nance! I'm more a garage sale junkie than a freegan, but a few months ago my husband and I saw a high-end office chair sitting on the curb. He needed a new chair, but it wasn't in the budget. We pulled over and discovered that something or someone had cut off the ends of the chair's arms, but otherwise it was great condition. We adopted it.